In Saberhagen’s current fantasy series, Faces are masks of tremendous power: they sink into the head of the wearer, endowing that individual with the abilities, attributes, memories, and personalities of a god (The Arms of Hercules, 2000, etc.). The gods, however, are fighting a war against the Giants, whose secret weapon can strip even the most powerful god of his memories and motivations. Sailor Proteus, having been aboard a ship attacked by a Giant, staggers out of the surf with a nasty lump on his head and virtually no memory. On the beach rests the ship Argo, aboard which are Jason and his famous Argonauts, about to set sail for Colchis, where they hope to relieve King Aeetes of the Golden Fleece. 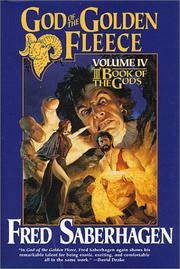 Saberhagen’s yarn, then, is based loosely on the ancient epic. But Proteus slowly gathers that his former self—Old Proteus—had been hired by Pelias to murder Jason. New Proteus has no such intention, and indeed is a loyal Argonaut, unstinting in his help for his shipmates. Gradually, too, he grasps that he’s no weakling even in the company of mighty Heroes. The Argonauts duly challenge Aeetes and make off with both the Fleece and Princess Medea. It’s not until Argo fetches up on the shores of the enchantress Circe’s isle, however, that Proteus begins to learn the truth about himself and, despite his still defective memory, formulates a plan of action. A splendid notion, the Faces, and this outing—plausibly blending ancient myth and modern fantasy—vastly improves on the two rather soggy previous episodes.